I’ve been sporting a messenger bag while riding for a few years now. That was the only way I knew how to carry stuff while riding my bike. Ever since I started commuting full-time by bicycle, I have noticed that I really need to have less weight on my back and would also like to have a less sweaty back. I knew about panniers but it seemed a little bit too much for my needs and I also wanted to be able to see the things that I am carrying in front of me (so I can tell if something has fallen out). So instead, I thought that a basket on my bike could work and aesthetically, I just like how a front basket looks on a bike. The Bike Porter from Copenhagen Parts, a chic minimalist design but packs a decent load. There are many front baskets but none come with the quality build and looks of the Copenhagen Bike Porter. It is a Danish product but you can order it from Mission Bicycle in SF. It has a minimalist look, a trademark of Danish design. It is made out of 6061 aluminum with an integrated handlebar. The size of the basket is 17 in x 14.2 in x 4.33 in (43.3cm x 36cm x 11 cm) and the width of the handlebar is 20 in (508 mm) long. It is about 3.6 lbs (1.63 kg) light but can carry up to 10 times its weight. I once carried an old Hewlett-Packard printer on it (yes, I got a lot of looks and comments on it that day) and there’s no other way I could have carried an object like that on my back or in a pannier. It’s a good-sized basket and retails at $199. 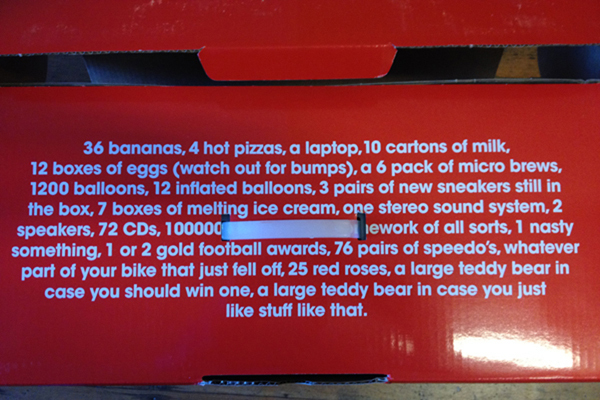 I love what’s written on the box that the basket comes in. Yep, 36 bananas, 12 boxes of eggs, or 76 pairs of speedo’s can fit into the Bike Porter. The downside for this rack is that it has big gaps. Stuff can easily fall through but that can be remedied but securing the cargo in different ways, like wrapping it with a couple of bungee cords. While I like the minimalist design of the Danish, Nellie likes the folksy style of the Dutch. Coincidentally, both countries, Denmark and the Netherlands, are known for their awesome bicycle infrastructure. Nellie does her grocery shopping sometimes by bike and needs a basket that can hold more than 10 lbs (4.5 kg) of groceries. Her old hand-woven basket from Peterboro Basket Company failed to do that. So we got a new basket for her and this new one goes extremely well with her Dutch-style Linus bike. It is a rattan style wicker basket by Eleven81. The wicker plastic material is reinforced with a metal frame while the bottom of the basket is made out of aluminum wires. Its durability, size (15.5 x 11 x 9.38 in/39.4 x 27.9 x 23.8 cm), and very easy lift off/on operation makes it a perfect grocery shopping basket. Now you don’t need to bring your re-usable bag with you to the market. Moreover, if you get stains or debris on it from the grocery items (produce can be very dirty sometimes) or what have you, the smooth material plus the wire mesh bottom make it easy to wash and rinse off. The basket retails at $48 USD. 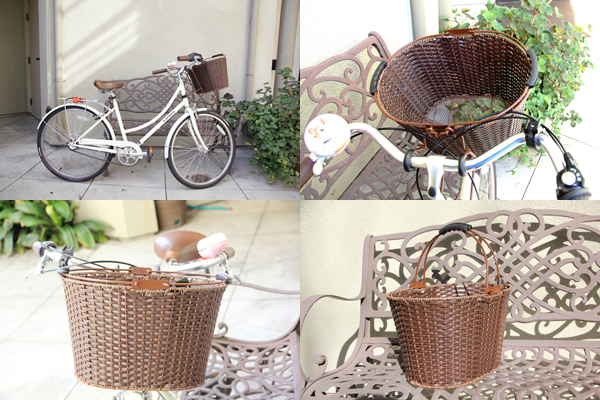 Eleven81 rattan-style basket, sturdy and convenient. The only negative she can think of is how the basket affects where you can mount a headlight onto the bike’s handlebar. Because the basket is mounted high above the middle section of the handlebar, the bike light needs to be mounted away from the center so it sits high enough. This makes it harder to see what’s directly in front of you in the dark since the light will not be pointed near the center of your path. But this may not be a problem with other bicycles out there, because the basket may sit differently on each of them. 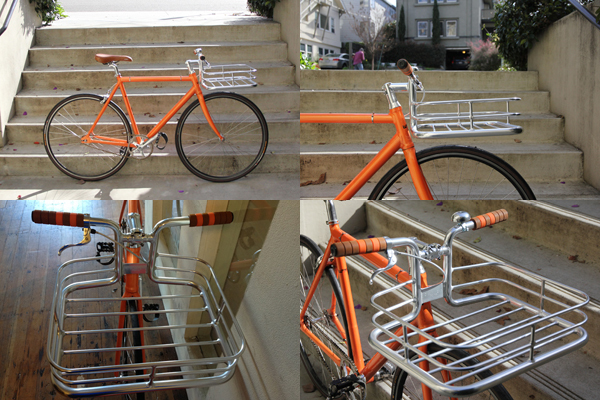 So, out of all the many bicycle baskets sold out there, we really recommend these two. A basket for him and a basket for her.